Disclaimer #2: I like marketing, and my opinion is strictly based on what I know about new technologies, not politics. The elections in November are already heating up, with the Maine US Senate race being one the most exciting to watch. With many candidates facing off in the primaries in a few months, it’s important to begin generating awareness. Websites, Facebook pages, and Twitter accounts are all popping up for the various candidates, yet I’m beginning to worry that the people behind these platforms are clueless about how the technology actually works. I’m sorry if I offend anyone, but this is starting to get depressing. I’m going to analyze the top three contenders at the moment (according to recent polling.) 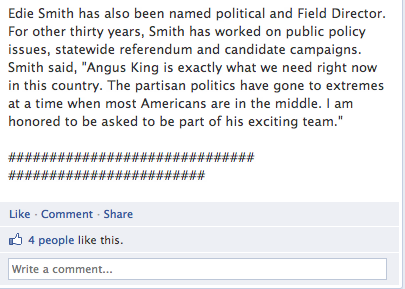 Those campaigns are: Angus King, Cynthia Dill, and Charles Summers. Parody accounts typically will attract a following, but in the overall scope of a campaign, I doubt they have little influence over the way someone votes. Well…..at least if you don’t attempt to shut it down, and generate numerous articles in the paper about it. 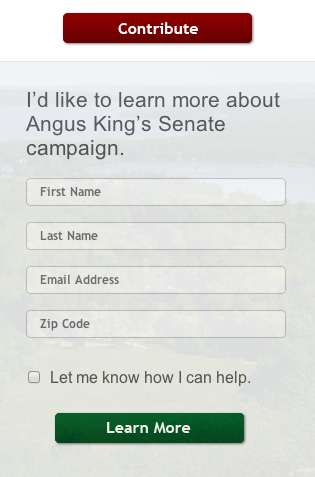 It took me ten minutes to find his Facebook page (there were at least 2 other “Angus King” pages.) Now, I would be willing to cut him some slack, until I found the official campaign page, and was instantly greeted by a press release. Nice copy/paste job right there #####################. Lastly, to top it off, there’s nothing like a little self-promotion via unnecessary #hashtagging. Charlie Summers has a Facebook page up and running, yet it took a while to find his website. Can someone please update his information section with the website URL on his Facebook page? I saw the earlier post with a link to the website, but as time progresses, fewer and fewer people will see it. Friends…it’s important to get the little things right. Another perfect example is the correct use of meta descriptions. Meta descriptions are used by search engines to index content. Put simply, these little tags are important when it comes to persuading visitors to visit your website. See the difference? Obama’s campaign has correctly used these little tags, encouraging people to visit the website. I can’t say the same for Mr. Summers. Also, one last pet peeve of mine. Can someone please get rid of this pixelated image on the website? Out of the three candidates, the Dill campaign has been campaigning longer than the rest. She has more Facebook fans, her website ranks well for “Cynthia Dill for Senate.” Overall, her campaign has the fewest errors, but once again. It’s the little things that matter. Time after time, I see Facebook pages with this issue. Facebook pages are nearly worthless unless they have a customized URL. The reason why this is an issue, is because until it’s changed (i.e. – Facebook.com/DillforSenate), your page cannot be effectively marketed offline. Direct Mail pieces will be less effective, and users are forced to search to find the page, instead of instantly locating it via a custom URL. To change the url, simply visit this link. To be honest, I’m not impressed with the look and feel of the website, but I’m surprised there are very few “calls to action.” I’ve visited numerous campaign sites, and it’s very important to have “contribute” “newsletter signup” and other important buttons in prominent locations. Sure, I noticed those links in the menu of the website, but it’s very important to have those ON THE HOMEPAGE. The Angus King does a decent job (shown below). Please don’t see this as an arrogant blog post, my goal is to point out how small modifications are IMPORTANT. Most of these problems I found are very simple to change. Next post Can Innovation be Learned?